The name Tawney/Taney appears frequently in the records of southern Maryland and along the Chesapeake Bay in the early 18th century, and it is here that the family likely first established themselves in Maryland. It is also probable that the our Tawney ancestors were related to the founders of Taneytown in northern Carroll County, and the infamous U.S. Supreme Court Justice, Roger Brooke Taney, however these connections have yet to be established. Our earliest identifiable Tawney ancestor is one Frederick Tawney, who begins appearing in records for Westminster, Maryland in the latter half of the 18th century. Although today Westminster and its surrounding districts are part of Carroll County, in the 18th century the area was divided between Frederick and Baltimore counties, and Frederick County is where we find the first records of our Tawney ancestors. In these and later records the name is spelled either Tawney or Taney. On February 5, 1777, the General Assembly of Maryland enacted a law which made it necessary to sign an Oath of Allegiance and Fidelity to the State of Maryland and the cause of Freedom during the Revolutionary War. These oaths were taken before a magistrate of the court. They included every free male 18 years and over, and all persons holding any office of trust or profit in the state. It is in this record where we find the first mention of our ancestor, Frederick Tawney. He is listed with a Michael Tawney, who was likely either Frederick's father or brother. In 1798 our ancestor appears in the tax assessment list for Westminster District, Frederick County. The assessment places Frederick Tawney in District 3, "Pipe Creek and Westminster Hundred," and also tells us the name of the two parcels of land he owned. The first is called "Good Fellowship," and includes a log house and a barn, both in good condition. The second parcel of land is called "Arnold's Remnant," named after the previous owner who is identified as "Archibald Arnold." Here the condition of the log house and barn are described as "poor." Frederick Tawney married a woman named Elizabeth, and they raised at least six children in Westminster, all of whom are mentioned in Elizabeth's will (see below). We are fortunate because our ancestor Frederick Tawney and his family appear in the first United States census taken in 1790. In the returns Frederick is listed as "Frederick Taney," and his household includes the following: 1 male 16 and older (Frederick), 4 males 16 and older (his 4 sons), and two females (his wife Elizabeth and a daughter). There is no other information in the census. Ten years later in the census of 1800 we find "Frederick Tawney" listed in the Westminster District of Frederick County. By this time his family had grown to include 3 males under 10, 2 males 10-16, 1 male 26-45 (Frederick), 2 females under 10, 1 female 16-26, and 1 female 26-45 (wife Elizabeth). The returns also indicate that 4 slaves were included in the household, indicating that Frederick owned a farm of at least modest size. Although by the early 1800s the majority of slaveholders were in the south, slavery still persisted in parts of Maryland. The fact that our ancestor was a slaveholder was a surprising and disappointing discovery. The family appears again in the census of 1810 for Frederick County, where we find F. Taney (Frederick) listed along side J. Taney and H. Taney. "J. Taney" is probably Frederick's son Jacob who by that time had started a family of his own. The returns for 1810 list the following: 1 male 10-15, 1 male 16-25, 2 males 26-44, 1male 45 and over (Frederick), 1 female 10-15, 1 female 16-25, 1 female 45 and over (Elizabeth), and 2 slaves. Given these ages it is likely that the household included husbands and wives of some of Frederick and Elizabeth's children. In 1820 we again find the Tawney family living in the Westminster District of Frederick County. Here the family of Frederick Tawney includes 2 males under 10 (undoubtedly Frederick's grandchildren), 1 male 10-16, 1 male 26-45, 4 females under 10, 1 female 16-26, 1 female 26-45, 1 female 45 and upwards, and 1 person "engaged in agriculture". This listing is curious because, although Frederick is listed as the head of the household, the returns fail to indicate a male 45 years and upwards. This was probably an error on the part of the census taker. It would also be Frederick Tawney's last census return. Unfortunately, certain records indicate that Frederick Tawney died in debt, and that his estate was eventually sued by his creditors. 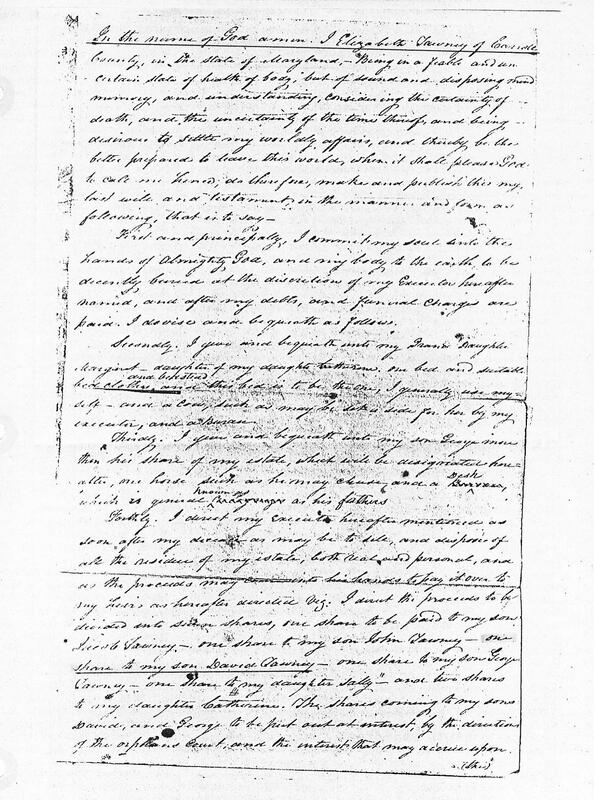 The evidence comes from his wife's Elizabeth's will (1837), in which she mentions a suit pending against her by the creditors of her late husband, and the three entries below from the Maryland Manuscripts Collection. The entries in question are all from the year 1829, some 4 years following Frederick's death. Two of the notes held against the estate of Frederick Tawney were to individuals, while the third was for money owed by the estate to "Branch bank." These are possibly the creditors that Elizabeth mentions in her will. In the 1830 census we Frederick's widow Elizabeth listed as the head of the household (the only time she would be named in census returns). She appears as "Elizabeth Taney" in the 7th District of Frederick County (The 7th district included Westminster.) Living near by is her son Jacob Taney and his family. Elizabeth's household includes only three individuals, 1 male 20-30, 1 male 30-40, and 1 female 50-60 (Elizabeth). This is the last time we will see the family in their original location outside Westminster. Elizabeth Tawney died on 31 March 1837 and was buried next to her husband at Kreider's church. She made out her will February 27th, and it was entered into probate on by her executor Jacob Shriver on April 10th, the very first will probated in the newly formed Carroll County. Elizabeth's will is on file (number 1) at the courthouse in Westminster. It is she makes extra provisions for her granddaughter Margaret and her son George. Margaret received Elizabeth's bed (a valuable possession in those days), and George received one additional share of his mother's estate. Other than these provisions, her estate is divided equally among her children. Follow this link for a transcription of Elizabeth's will, or click on the links below to view the actual will. We don't know what happened to the Tawney family following Elizabeth's death, although they seem to have disappeared. I have found none of Frederick and Elizabeth's sons in the 1840 census, including our next ancestor, David Tawney, who by then would have been about 30 years old. Fortunately David and family would resurface in the census of 1850. Our next ancestor was David Tawney, son of Frederick and Elizabeth Tawney. He was born in 1810 and married Mary Ann Spencer in 1840. Their first child and our next ancestor James Thomas Tawney was born the following year in 1841. In 1850 we find the family of David Tawney living, not in Westminster, but rather in the 5th District of Baltimore County, Maryland. The census of 1850 was the first modern census - the first to list all members of the household rather than simply the head of the household. 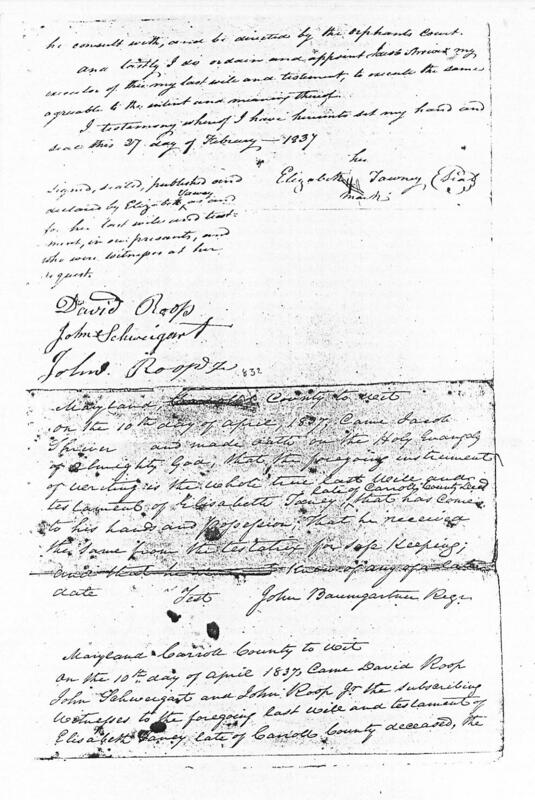 The head to the family was David Tawney, (age 39), who is listed simply as a laborer, followed by his wife Mary Ann (Many - age 32), children Thomas, (James Thomas, age 9), George, (age 7), Andrew, (age 5), and Charlotte, (age 10 months). There is little other useful information in the census. In the census of 1860 the Tawney Family is still living in the 5th District of Baltimore County, Maryland, Post Office - Reisterstown. Although the 1850 census was the first modern census, the information offered was minimal. It was not until 1860 and 1870 that other useful details began to be included in the returns. In 1860 the Tawney family includes David Taney, (age 49), wife Mary, (age 41), and children James T., (age 19), George H., (age 17), Andrew C., (age 14), Charlotte, (age 10), Ruth, (age 7), and John, (age 5). David is listed as a "Blacksmith," owing real estate valued at $700.00 and personal property valued at $200.00. Son George is the only other member of the household with an occupation - "Laborer". "St. John's congregation was organized by the Reverend J. Philip Willard, who served the Westminster Charge 1842-1845. During the revival period of 1843 and 1844, services were conducted by Reverend Willard in Abbott's School House, a short distance from the present Church on the Westminster-Hampstead Road. The result of these services was the organization of the church, February 11, 1844 with 52 charter members. The first church was erected on a two-acre plot of ground sold by Daniel Leister and John Reese. The original Church was a plain log structure 35 x 40 feet. On November 6, 1898, the present church building was dedicated." In 1870 we find the family of James T. and Mary Tawney back in the familiar confines of Carroll County, Maryland - 4th District, Post Office New Windsor. James was still living with his parents in Baltimore County in 1860, however records on file at the courthouse in Westminster indicate that his marriage to Mary Elizabeth Lockard took place in Carroll County in 1862. Therefore we can assume that James returned to Carroll County sometime around 1861. 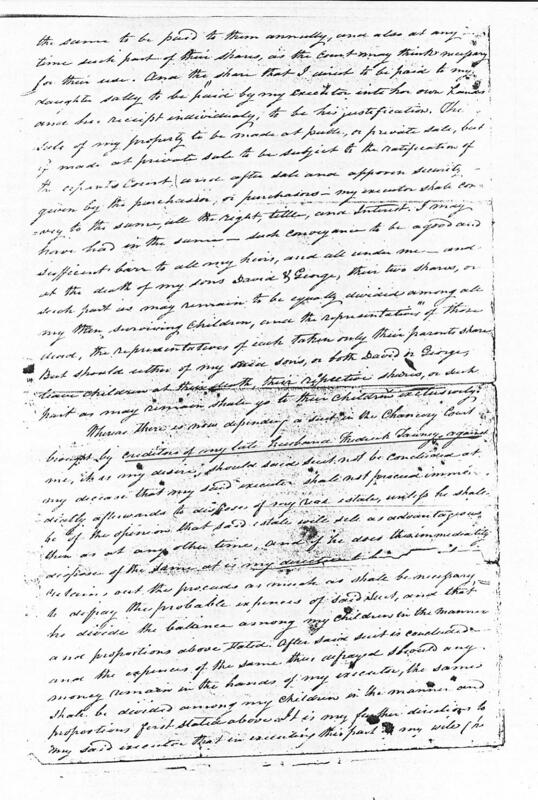 The census lists James T. Tawney, as the head of the household, followed by his wife Elizabeth, , and children Rebecca, (age 7), Mary E., (age 5), Andrew, (age 3), and James, (age 6 months). James's occupation is listed simply as "Day Laborer". The ages given for James and wife Elizabeth are 40 and 36 respectively. This is a mistake. Their ages in 1870 should have been listed as 30 and 26. Next to the Tawney's we find the family of Mary's parents, William and Sarah Lockard. The Tawney and Lockard family would remain near neighbors in the 4th District for many years to come. In the 1880 census we again see the family of James T. and Mary E. Tawney living close to Mary's parents William and Sarah Lockard in the 4th District of Carroll County. This is the same location were we found both families in 1870, an area that was also known as Woolery's District. We are fortunate because the 1877 atlas of Carroll County reveals the approximate location of the families of James Tawney and William Lockard - the far northwest corner of Woolery's District. The 1880 census lists James Tawney, (age 39), wife Mary E., (age 37), and children Mary E., (age 15), Andrew J., (age 13), James, (age 11), William, (age 9), Catherine, (age 7), and Georgiana, (age 4). This time James Tawney is listed as a Blacksmith, an occupation his father followed while living in Baltimore County. The 1880 census also has a category for any major illness afflicting family members. This is how we learn that James Tawney (Sr.) was suffering from "Liver Disease," and daughter Catherine was suffering from "Consumption". Fortunately, both Catherine and her father would survive their illnesses to be counted in future census returns. The returns show that daughter Sarah Rebecca was living nearby with her grandfather and grandmother William and Sarah Lockard, where she is listed as Rebecca Tawney - age 16. By 1900 Mary Tawney's parents William and Sarah Lockard had died, however the Tawney family was still present in the 4th District of Carroll County. James Tawney, (age 59), is the head of the household, followed by his wife Mary E., (age 38), and children Catherine, (age 21), Frank E., (age 19), Emma M., (age 14), and John C., (age 7). James is listed as a farmer, the owner of his farm, while daughter Catherine is listed as a "House Keeper". Interestingly, Frank Tawney is listed as a soldier, although I have no other information regarding his occupation. The returns tell us that Mary Tawney had given birth to 11 children, 10 of whom were still living in 1900. Son Patrick Henry Tawney died in 1881, and was likely the first family member buried at the nearby Leister's church cemetery. Catherine Tawney, age 29, would die in January of 1901, just months after the 1900 census was taken, and was also buried at the Leister's church cemetery. Over in District 7 of Carroll County (closer to Westminster) we find the families of children James T. Tawney, Jr., Andrew Tawney, and Milton & Annie Tawney Little. James Tawney is working as a laborer for the railroad, Andrew is listed as a farmer, while Milton Little's occupation is listed as "works on lines - Taney". By 1910 all the children of James and Mary Elizabeth Tawney were grown and out on their own. The census of 1910 shows that James and Mary were still residing (by themselves) in District 4 in Carroll County. James is age 69, occupation, farmer. Mary E. is listed as 66 years old, the mother of 11 children, 9 of who were still living in 1910. As mentioned previously, son Patrick died in 1881 and daughter Catherine in 1901. Sons James and John Tawney are living close to their parents in the 4th District, and daughters Anna (Little) and Mary E. (Freberthauser) are living nearby in the 7th District. Mr. James Thomas Tawney died at his residence, Manchester Avenue, this city, Saturday, June 15th, aged 77 years, 3 months and 13 days. He is survived by his widow and the following children: Mrs. John Little, Mrs. Etta Harman, Mrs. Milton Little, of this city, and Miss Mae Tawney of Savannah, Ga., and Messrs. Andrew Tawney, James Tawney, Frank Tawney, William Tawney, and John Tawney, and about 35 grandchildren. A short prayer and song service was held at the late residence, Monday, June 17th, at 2 P.M., and further services were held at Leister's Church. Interment was made in Leister's Church Cemetery. The pallbearers were" Messrs. Jacob Long, Isaac Long, Andrew Long, Miles Long, Joshua Murdock and Robert Green. Mary E. Tawney makes one final census appearance in 1920 before she died in 1926. In the 1920 census we find Mary E. Tawney, (age 76, widowed), living in Westminster on Manchester Avenue on what I will call "Groft Row," that group of Groft family houses that included Charles L. Groft and several of his children. The returns show that Mary Tawney was living by herself, but next to her granddaughters Mary Little Groft (wife of Harry L. Groft), and Anna Little (wife of Milton Little). Mrs. Mary Elizabeth Tawney, Manchester Road, this city, died Saturday, July 10, 1926, aged 83 years and five days. She was the daughter of the late William Lockard and is survived by the following children: Mrs. John Little, this city; Mrs. A.B. Freberthauser, Tannery; Andrew Tawney, Monroe; Mrs. William Tawney, Mrs. Martha Little, Harrisburg; Frank Tawney, Avondale; Mrs. Robert Ware, Atlanta, Ga., and John Tawney, Wilmington, Del. She also leaves 34 grandchildren and 37 great grandchildren. Tuesday funeral services were conducted at St John's Catholic Church at 10 o'clock. Burial was made at St John's (Leister's) church cemetery. Mary's daughter Sarah Rebecca Tawney and her husband John Little were living a few blocks away on George Street. Sarah would die in Westminster in 1953 in her 90th year, 176 years after her great grandfather signed the oath of allegiance to the fledgling United States of America in 1777. With her passing the story of our Tawney ancestors comes to a close.